Gan Lu, which means "Sweet Dew", is a very famous tea in China. Legend has it that the Gan Lu tea plant was first cultivated by the legendary Buddhist monk, Wu Li Zhen. After he achieved Nirvana, the locals around Meng Mountains nicknamed this tea "Xian Cha", which means Tea of the Immortal. Only the leaves picked in the misty peak areas of Mount Meng can be considered as true Meng Ding Gan Lu. As suggested by its name, this tea is refreshing and has a very sweet aftertaste. 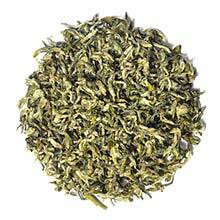 The curly green tea leaves are partially covered with white/silver pekoe. The infusion yields cups of light yellow color tea.